A beautiful white or peacock keshi pearl bracelet. A modern twist on a classic pearl bracelet that makes a unique gift for any woman to treasure. 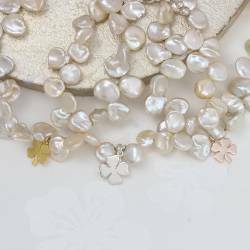 This bracelet makes a wonderful present for some with a June Birthday, as pearl is their birthstone, or perhaps a thank you for your bridesmaids or Mother. This stunning white or peaock keshi pearl bracelet is available with a sterling silver, gold or rose gold plated trigger clasp and extension chain. It was said in some early cultures that the pearl was born when a single drop of rain fell from the heavens and became the heart of the oyster. Pearls have been called the 'teardrops of the moon'. Some believe that pearls were formed by the passage of angels through the clouds of heaven. Over time, the pearl has become the symbol of purity and innocence and it is often sewn into bridal gowns, or worn as jewellery by the bride. So pearls are the obvious choice for wedding jewellery, both for the bride and her bridesmaids as well as the mother of the bride or groom as the wearing of pearls takes the place of the bride's real tears, thus she'll have a happy, tear-free wedded life. Your pearl bracelet will be beautifully gift wrapped in a matt black box, tied with ivory satin ribbon and a gift card enclosed. This standard service is completely free of charge.